MARKS AND SPENCER is seeking 97 voluntary redundancies across seven stores in the Republic of Ireland. The seven stores in question are Liffey Valley, Dundrum, Mary Street, Grafton Street, Blanchardstown and Cork’s Patrick Street. Marks and Spencer has said “this is purely a voluntary proposal”. Last May, Marks and Spencer announced plans to shut more than 100 “underperforming” stores in the UK in an ongoing restructuring of the company. 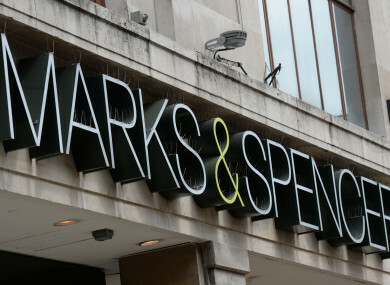 “M&S will now close over 100 stores in total by 2022, including 21 that have already closed and the 14 stores that are announced today as proposed for closure or set to close,” the company said at the time. No Irish stores were affected as part of the move. The following day, the retailer announced it was to reduce 200 products by an average of 24% in a bid to compete with discount retailers. Email “Marks and Spencer seeks 97 voluntary redundancies across 7 Irish stores”. Feedback on “Marks and Spencer seeks 97 voluntary redundancies across 7 Irish stores”.